TURBO 4 WITH AUTOMATIC -- LEATHER & HEATED SEATS -- HARMAN KARDON AUDIO -- CLEAN CARFAX! 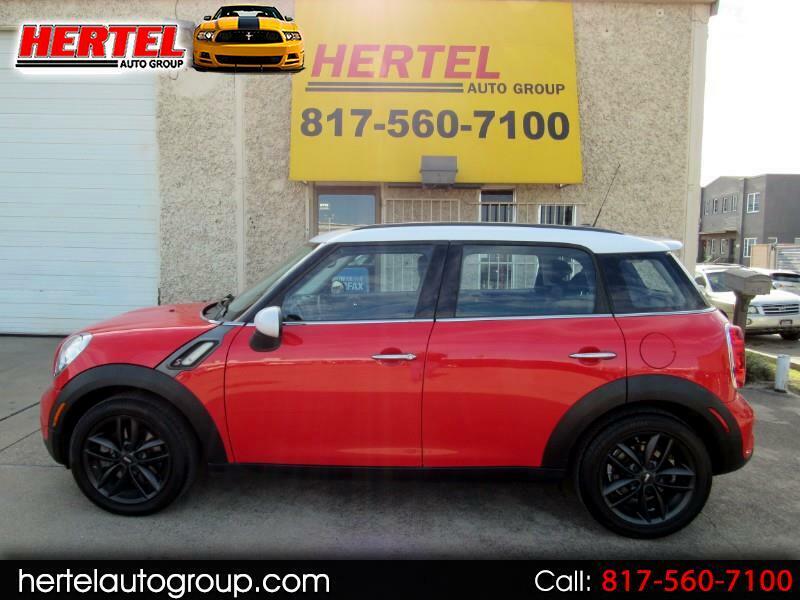 Hertel Auto Group is pleased to offer this red-hot, fun-to-drive, hey-look-at-me 2012 MINI Cooper S Countryman 4-Door Hatchback for sale in Fort Worth Texas. Wow! If you've been looking for a car that will get you noticed...that will draw admiring stares from just about everyone you pass...can handle curves as tight as your grandmother's hugs at Holiday gatherings...and yet sip fuel like a boring econobox, then this is definitely the car for you! You'll love from the first start-up to the moment you park to get out. In fact, you'll probably be looking for reasons to drive it more often, and on longer trips than just about any other car you've ever owned. For years, the MINI Cooper was a great car for style and performance reasons, but not so much for room and versatility. Its front seat barely fit 2 passengers and a shopping bag; not to mention the teeny-tiny backseat. All that changed with the introduction of the MINI Countryman. The Countryman is a true compact wagon that offers almost 3X as much cargo capacity as the Cooper hatchback, along with a usable rear seat. In addition, the rear seat slides back to provide enough comfortable legroom for adults, and you can slide the seat forward or fold it almost completely flat to further enhance cargo capacity. And while the Countryman is bigger than the standard Cooper, its larger size doesn't significantly affect handling; this Mini is almost as nimble as its hatchback sibling. On the road, this more sporting "S" model upgrades the standard 1.6-Liter DOHC 16V 4-Cylinder Engine with a Turbocharger that boosts output from a leisurely 121 Horsepower to a grin-inducing 181 Horsepower that also drops 0-60 times by over 2 seconds! Besides its sporting nature, you'll also enjoy getting up to 32 mpg on the highway via its slick-shifting Automatic with a Manual Shift Option. Mechanically, it starts, runs, performs, shifts and drives exactly like you'd expect it to. All four 205/55R17 tires mounted on OEM 17" Blackout Alloy Wheels are in very good to good condition. On the outside, this MINI Countryman boasts an eye-catching, conversation-starting Chili Red Paint Scheme is complimented by a Black Leather interior. On the inside, the smoke-free interior of this Countryman S is nicely equipped with Keyless Ignition; Heated Front Seats; USB & AUX Ports; Power Windows, Locks & Mirrors; Cruise Control; Steering Wheel Controls; 10-Speaker Harman Kardon Audio System; CD Audio; Cold A/C and more. As with any pre-owned vehicle, it does have the usual amount of cosmetic imperfections that are inherent to a vehicle of this age and mileage. We invite you to view all of the photos on our Web site and determine for yourself it this vehicle meets your expectations for a vehicle of this age and mileage. If it does, then we invite you to come in for a viewing and test drive of this sharp-looking 2012 MINI Countryman S Wagon. Based on its condition, mileage, options, ownership history and scarcity in the marketplace, we've priced it fairly and expect it to sell quickly. Don't let it pass you by!